Purpose: Use this document as a reference for manually reconciling P-Card transactions/statements in ctcLink. Use the Procurement Card Transaction page to review, manage, and approve procurement card transactions loaded by the Load Statement process. You can view all of the procurement card transactions that you have been granted authority to access on the Cardholder Profile - Card Data: Assign Proxies page. If appropriate, click the Distribution button to define account distributions for any each line. Review the Chartfield details for the transaction and if appropriate, update. When finished, click the OK button. Note: The key difference between the ProCard Account Distribution page and the Distribution Templates/Reset Status page is that this page affects one statement line at a time. The Distribution Template would override the distribution information and there is no need to override. Do NOT use the Distribution Template link. If appropriate, define additional statement line purchase order details by clicking the Purchase Details link at the bottom of the screen. 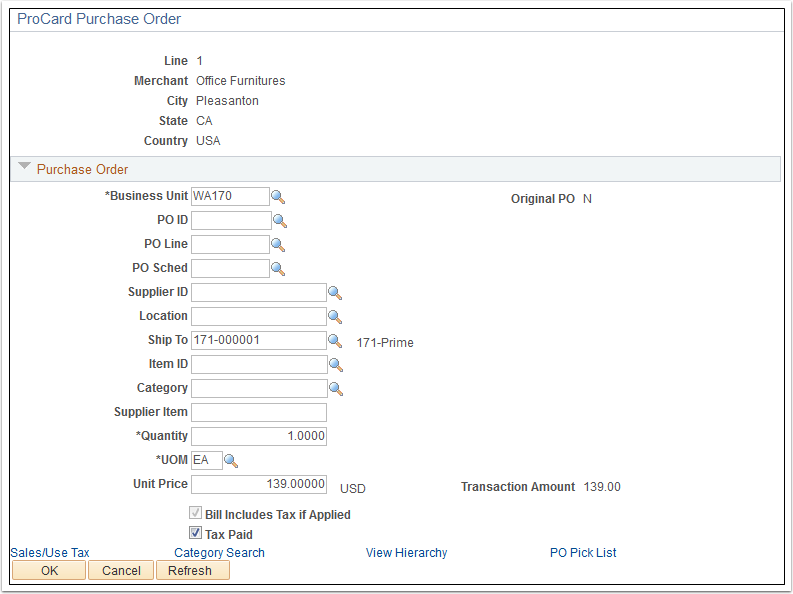 Note: Once a purchase order is referenced by procurement card transactions you are no longer able to modify the ChartFields on this page. Use the ProCard Purchase Order page to add additional tax information. Enter statement line tax information, if applicable. The Sales/Use Tax link at the bottom of the page is used to enter optional tax information related to the statement line. When finished click the OK button. Note: This data is informational and not passed to the General Ledger. This information is pre-filled if Purchase Order information has been linked. If you need to split a statement line, click the Split Line link at the bottom of the screen. This link will allow you to take one purchase and separate it into multiple lines that can then have different distributions assigned to them. For instructions, refer to QRG Splitting and Updating Transaction Lines. Use the Billing tab to review the billing transaction details. Enter Description information for each line if applicable. If your records disagree with the billing amount, enter the amount difference in the Disputed Amount field. This does not mean that you are not liable for the purchase, but rather acts as a notation that the user reconciling this account must follow up with the merchant or procurement card supplier to settle the disputed amount. If you enter an amount, the statement line is visible on the Review Disputes – Dispute page until it has been identified as collected. The Credit Collected check box displays the status of the disputed amount. If clear, the dispute is still open. If selected, the dispute has been identified as collected or closed on the Review Disputes – Dispute page. Update the transaction Status for an individual line or for many lines in mass. To change the status for multiple lines at once, click the check box next to each line and use the buttons at the bottom of the page (Stage, Verify, or Approve) to change the status to the appropriate value. Perform Budget Validation on a transaction using one of two available methods. You have the option to perform Budget Validation on all the transactions when you save the page or you can select transactions and then perform Budget Validation on those transactions when you click the Validate Budget button. Click the Save button to complete processing.